Amidst the voice and noise of social customer conversations. Are you looking to intelligently harness the real power of social media for maximum brand advantage? Are you able to integrate this data, information, conversations and impressions to get a 'single' voice of truth? Does your team need an intelligent system that translates this context to benchmark your brand's performance against competition or wider industry? You look for value propositions that go beyond your competition and outperform goals on brand leadership, customer centricity and topline growth. SocioSEER™ sieves, filters, categorizes and transforms online social impressions into positive forces of changes. 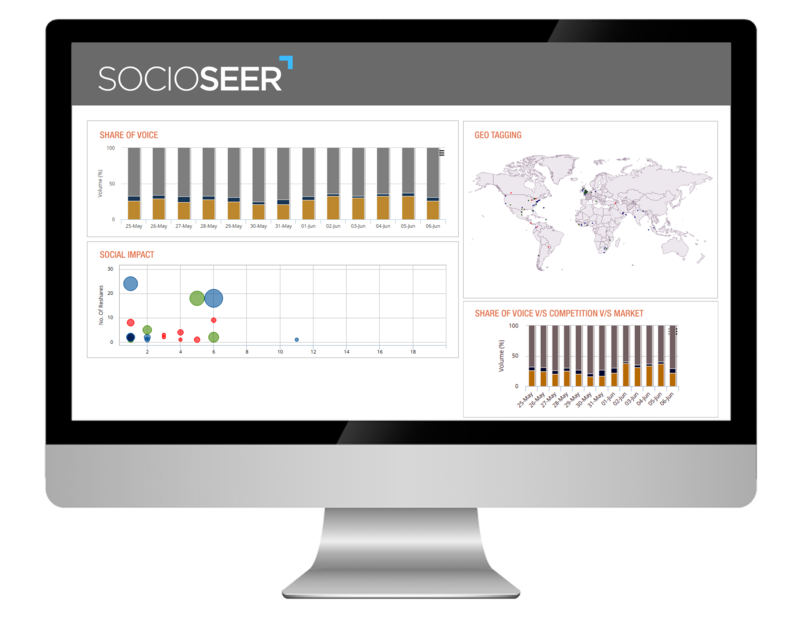 SocioSEER™ gives you wide-ranging, real time metrics on loyalty, sentiment, perceived value, customer association and more. It provides proactive scenarios and crisis planning to build trust and advocacy with influencers. It leverages the market and its active participants to give industry-specific social research for categorized theme sets and optimize media marketing mix for better ROI. SocioSEER™ is currently being deployed by businesses across industries, including global media houses, beverage retailers, pharma companies, global airline alliances and many more. We have co-opted the disruptive tools in the delivery models.